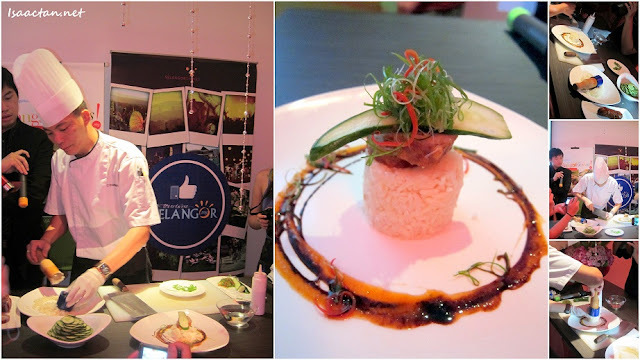 Selangorlicious!, if you haven't heard of it yet is this really cool food blogging competition held to highlight and promote Selangor as a food destination. With Selangor Tourism Sdn Bhd as the official tourism board, Selangorlicious had successfully held a couple of competitions in the past. Today, I was present at the launching of the Selangorlicious' Foodster Chinese Blogging Competition. This round, with the contest running from 28th October - 2 Dec 2011, if you own a food blog in Mandarin, do a post, submit it and be prepared to win some really awesome prizes. The launching of the Chinese Blogging Competition was held at this rather cool new spot My Cookbook in Sunway Giza Kota Damansara. I missed the past competitions held for the English and Malay language blogs, hence I was really interested to attend this event to find out it is all about. Unfortunately I'm unable to join this competition myself unless I go for a crash course to pick up Mandarin writing skills. Monday – Thursday: 11:00 a.m. till 12:00 a.m.
Friday – Sunday: 11:00 .m. till 1:00 a.m. Anyway, the night started out pretty well, where upon the arrival of the bloggers, Tourism Selangor representatives, My Cookbook owner, and the organizers, we sat through a couple of speeches to launch the Chinese Blogging Competition. There were even some knowledge sharing by the past winners on tips for good food writing and photography. Food blogging has evolved into an art, which I am slowly learning to appreciate. Yours truly with the Selangorlicious English Food Blogging Winner Nigel Low and his beautiful partner. Important people for the night which included representatives from Tourism Selangor, and My Cookbook. 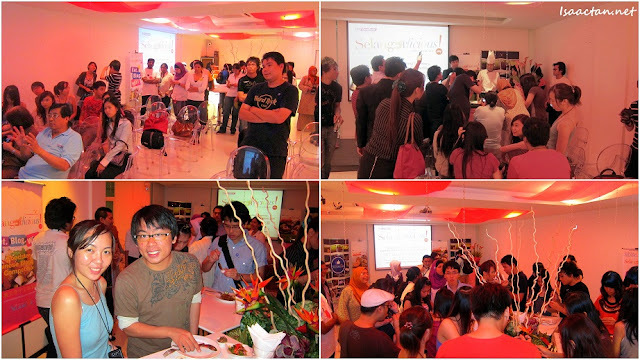 It was a jolly good and warm environment where everyone were friends in their love for food. Of course, a food blogging competition launch won't be complete if there wasn't any food involved one way or another. Hence we were treated to a short food demonstration by the chef of My Cookbook on the preparation of their signature chicken rice. 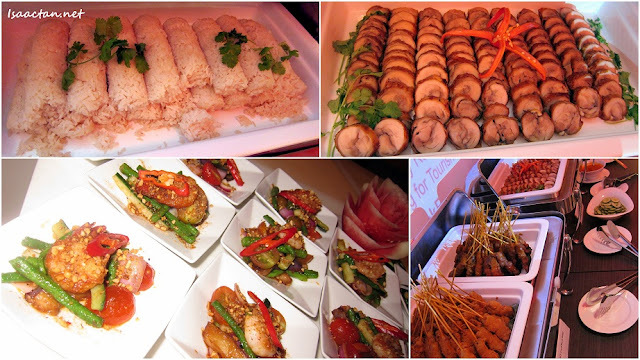 Immediately after the food demonstration, the buffet spread was opened to us, and that was when our stomach literally bounced with joy at the sight of the wonderful food served. My favourite, a plate full of Satays with sliced cucumbers and onions! I truly enjoyed the satays that were served that night. My Cookbook actually served two different types of Satays, the conventional grilled one, and the more unique tempura fried Satay. Needless to say, I took a wee bit too much Satays for the night. It was a good way to end the night, as we had ample time to mingle around with the crowd. I was glad to be able to meet more new blogger friends, foodie bloggers to be exact. So again, if you can write in Mandarin, and love to win some cool cash and prizes, remember to head to http://selangorlicious.my when the competition is up on 28th October 2011! AHHHHHHHHH TEMPURA SATAY!.. it's midnight aand im craving for one!.. in which im not supposed to! Everytime I come over to your blog, I end up hungry. Note to self: Must eat kenyang2 before go to Isaac's blog. Wow! I want those satays!! Yum! Wahhhhhh!!!! I would love to attend this event. Chinese...ummm...sorry lah! It's Greek to me. hahaha, no wonder satay habis! Wei! makes me drool in jealousy lar wei! wow, got such competition one ah?? specifically for chinese food bloggers in selangor?? interesting..
oh, i love the food presentation demo, looks cool..
ahahah~ that's true. I would need to take a crash course in Chinese too if I wanna join. haha. I think u like satays very muchhhhhhhhhh!!!! The satay looks different.. like they are fried? oh tempura.. baru nampak! hahaha.. something unique..
Wahh nice food! I haven't been to this place before yet.. heard so much about it! Oh must be in 是不是 then you can get your missus to help you in the competition. Nice satays. The food they served certainly look enticing, yummy!